The Buffalo Bills defeated the Minnesota Vikings, 27-6, continuing the third full week of action in the NFL. Josh Allen had some turnover luck today with a dropped interception and a fumble off a sack that his tight end recovered, but his ability to manage pressure was otherwise impressive. Minnesota pressured him off the edge throughout the game, and he was able to use his feet to get out of a number of jams and either run for quality gains or find open outlet targets. The Bills had some pretty significant struggles on the offensive line, in particular with center Russell Bodine on run blocks and right tackle Jordan Mills in pass protection. Bodine was frequently stacked by Minnesota’s stud defensive interiors, and Mills was repeatedly beaten on the edge on a variety of moves by a number of different defenders. Jerry Hughes wreaked havoc all day long against the Vikings’ offensive front. He was in the backfield causing pressure on what felt like nearly every play, and Minnesota just didn’t have an answer to stop him. The Buffalo defense, in general, were disruptive across the board with their pass-rush (Lorenzo Alexander had himself a fine day rushing the quarterback, as well), but Hughes was the star. Shorthanded in the secondary the Bills got a nice game from Taron Johnson. It wasn’t a perfect performance from the fourth-round rookie, as he was beaten a few times in coverage, but he did a nice job throughout the afternoon at closing down on short underneath passes and had a really nice play in the fourth quarter breaking up a pass on a slant route to Adam Thielen. Stephen Weatherly was a bright spot for the Vikings’ defense, as he was effective in both phases on the edge. He notched multiple pressures coming off the edge with both speed and power moves, and his quickness allowed him to knife inside blockers to penetrate the backfield on multiple run plays. Trae Waynes missed an opportunity to turn the game around in the first quarter when he dropped a badly underthrown deep post by Allen. Credit Bills receiver Robert Foster who turned defender on the play, but if Waynes makes that play, the rest of the game could have tracked differently. It was a rough day at the office for Kirk Cousins. The Vikings’ signal-caller struggled to keep the ball secure in the first quarter, coughing up two fumbles in the pocket – both recovered by Buffalo – and he struggled with his accuracy early on top of that. Cousins was able to get into a bit of a rhythm later on, but it was largely through the short game against a softer secondary. The Vikings’ offensive line really struggled to keep pressure off their quarterback today, especially on the left side of the line where Hughes seemingly had his way with Riley Reiff all afternoon. Buffalo got consistent pressure all throughout the game and was able to do so primarily with their four-man rush. Allen’s ability to make plays on the run kept the Vikings’ defense off balance in the first half. 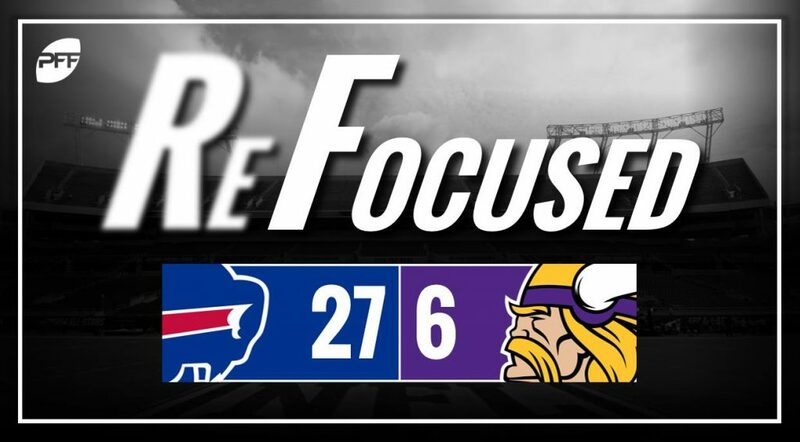 Buffalo’s defense was able to capitalize on some early turnovers, and once the Vikings were forced to play through the air, the Bills were able to dial it up and get pressure at will.